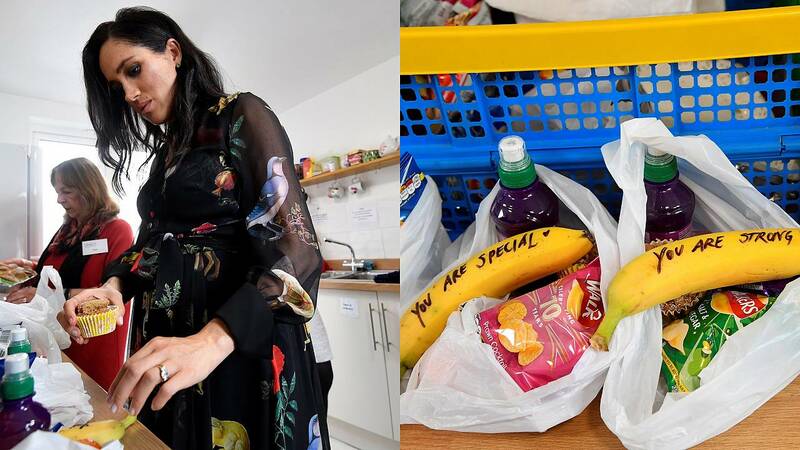 Women trying to escape prostitution in the U.K. were treated to a surprising gesture by the Duchess of Sussex. But instead of writing notes on paper, the duchess, who is pregnant with her first child, decided to write empowering notes on the peels of bananas included in the meals. Using a black pen, she wrote "You are brave!" "You are strong!" "You are loved!" and "You are special!" in bold letters. It just so happens that she and her husband, Harry, Duke of Sussex, are a bit bananas over bananas. Before the royal wedding, it was even rumored that their wedding cake would be banana flavored. They went with a lemon sponge cake flavored with elderflower syrup. But the duchess is so fond of the fruit she even baked her own banana bread to bring to a barbecue during a tour of Australia and New Zealand. The duke and duchess were visiting Bristol, a city in southwest England, to see how the charity operates. They also visited the organization Empire Fighting Chance, which helps at-risk youth transform their lives through non-contact boxing. The couple also visited the Old Vic theatre, which bills itself as the oldest continuously-operating theater in the English-speaking world. It seems that royal visit made quite an impact, with many people on Twitter sharing their love and support for the couple. While the former Meghan Markle's idea was very cute, she isn't the first person to write happy messages on banana peels. A cafeteria worker at an elementary school in Virginia Beach started the same tradition, writing empowering messages on bananas that she served to students.